Many in Europe continue to believe in the permanence of the Eurosystem. 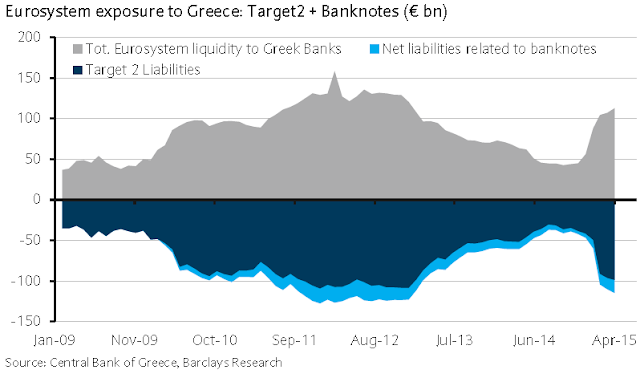 The Bank of Greece is controlled by the ECB and its assets and liabilities will always be consolidated into the Eurosystem. By this argument, the collateral held by the Bank of Greece as part of the ECB's financing of Greek banks belongs to the Eurosystem. Therefore if the Greek banking system were to fail, at least the Eurozone's central banking system can keep the collateral. Let's be clear: if Greece were to exit the currency union, the Bank of Greece and its assets would be immediately expropriated by the Greek government (making them part of the "new" Bank of Greece). Many in Europe are pointing out how such action would be illegal. There nothing "legal" about Grexit to begin with - the system was designed to have laws for "marriage" but no laws for "divorce". And with the Bank of Greece exiting so would go the collateral. To assume that the Bank of Greece is a permanent fixture of the Eurosystem is not prudent credit risk management. Therefore the Eurosystem's exposure to Greece should be added to the €323bn of other debt. Having said that, Target2 debt owed by the Bank of Greece to the Eurosystem has no maturity and requires no immeduate payments. Therefore a standalone Bank of Greece may choose to keep the liability outstanding in order to get access to the euro payment system. The Eurozone's political leadership may however demand a timely repayment of these balances, given the size of the exposure. This central-bank-to-central-bank exposure is now rising rapidly as the ECB approves a new limit increase for emergency funding (ELA) on a daily basis. 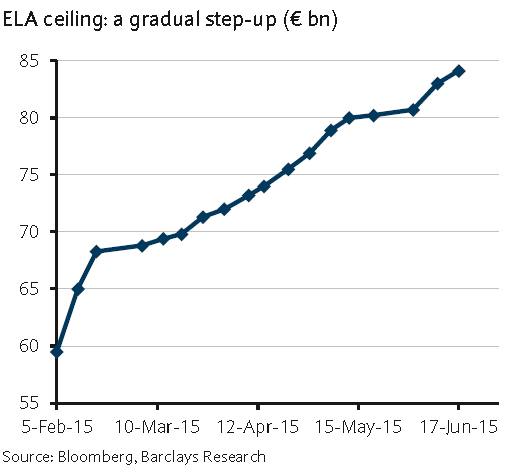 This is what a run on the Greek banking system looks like. While some accounts are moving abroad and into other assets (including European bonds held in foreign accounts and even into bitcoin), much of the withdrawal activity is simply converting deposits into banknotes. Anecdotal evidence suggests that many in Greece are leaving a minimal amount at the bank to keep the account open and the rest is in cash stored under the kitchen tiles, etc. 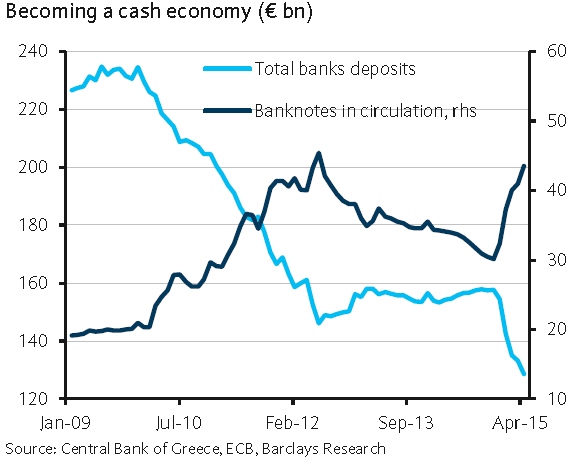 Greece is quickly becoming a cash economy. Capital controls could be the next logical move by the Greek government and the population and businesses are simply protecting themselves. Bloomberg: - Dorothea Lambros stood outside an HSBC branch in central Athens on Friday afternoon, an envelope stuffed with cash in one hand and a 38,000 euro cashier’s check in the other. She was a few minutes too late to make her deposit at the London-based bank. She was too scared to take her life-savings back to her Greek bank. She worried it wouldn’t survive the weekend. “I don’t know what happens on Monday,” said Lambros, a 58-year-old government employee. There is hope however for a less-than a disastrous outcome. These near-panic conditions could be sufficient to bring the nation's leftist government back to the negotiating table this weekend. However, time is fast running out as €1.6bn is due to the IMF in less than 10 days.